Corn lily is a coarse, erect perennial herb that grows in many of the Park’s meadows. Its tall stalks dominate some meadows in the park at elevations of 6,000 to 11,000 feet. It is an interesting plant in all phases of its growth. In the spring, it emerges from the meadow turf as numerous green shafts, similar in appearance to broad, asparagus stalks. Its leaves are tightly wrapped around the stem. Actually, the plant consists of one unbranched stem of numerous clasping leaves. These broad, boat-shaped leaves open rapidly as the summer progresses, finally becoming 6 to 12 inches long and 3 to 6 inches broad with prominent parallel veins. The unfolded, pleated leaves make interesting designs and patterns for the photographer. The flowers generally are not abundant. But when they are present, they make a striking display in contrast with the bright-green lower leaves. The flowers are small and whitish but are arranged on a tall flowering stalk. The flowers, or inflorescence, make a panicle (8 inches to 2 feet long). The small white flowers are numerous along the long stalk. As a member of the lily family, it has perianth segments of three sepals and three petals. There are Y-shaped glands at the base of each petal. The stamens are short but curve outwards, making them conspicuous. The plant has a short, thick rootstock, fibrous, coarse and numerous. 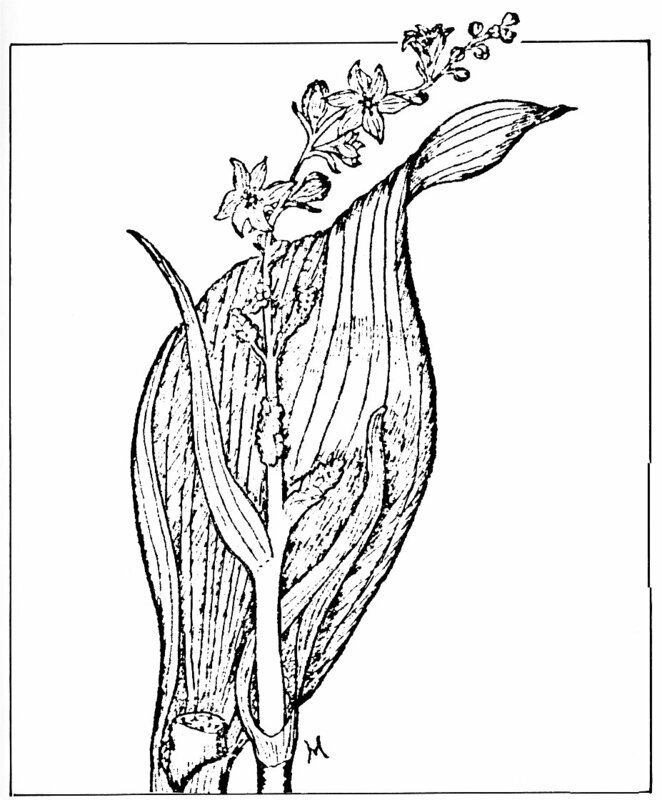 The Corn Lily, as was mentioned, is very irregular in its blooming. Many plants go years without producing flowers. According to Carl Sharsmith, it seems the higher the altitude the more irregular and sparse the flowering. 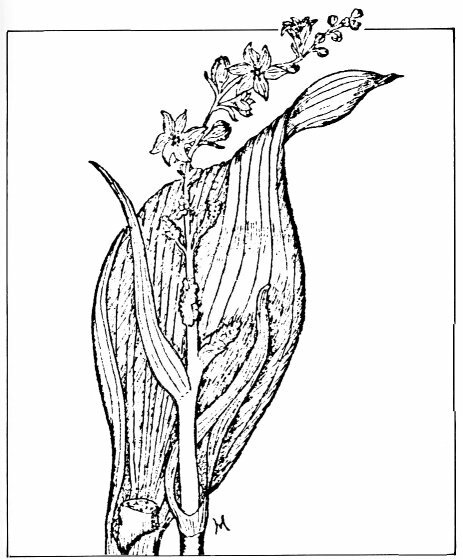 One of the most poisonous plants in Yosemite, the Corn Lily, has caused violent illness to those who have eaten it. All parts of the plant are poisonous, but especially the roots. The poison derives from numerous and complex alkaloids.1 A dominant poisonous substance is veratrin. Some of the alkaloids are found to have properties with marked hypotensive effects on humans. Lowering of blood pressure appears to be effected by dilatation of arterioles together with constriction in venous vascular beds.2 This is accompanied by slowing of the heart rate. Corn Lily is poisonous to animals as well, but as a rule they do not eat it because of its sharp, burning taste. Chickens have been poisoned by eating the green tops or seeds.3 The flowers are poisonous to insects and heavy losses in honeybees sometimes occur. The symptoms of poisoned victims are salivation, vomiting, purging, abdominal pains, muscular tremors, spasms and weakness, difficulty in walking, general paralysis and occasionally convulsions.4 The suggested treatments are to induce vomiting and flushing, cardiac and respiratory stimulants and quiet rest.5 It is a beautiful plant to observe but not to consume. 1) Muenscher, Walter Poisonous Plants of the United States, Collier Books, N.Y., 1975. 3) Gress, E.M. Poisonous Plants of Pennsylvania, Penn. Dept. of Agr. Bull. 531, 1935. 4) Kingsbury, John. Poisonous Plants of the United States and Canada, Prentice-Hall, Inc., N.J., 1964.